Nothing says 'let's take a stand against law enforcement' like writing slanderous statements on a copper's fast-food order. The fast-food drive-thru offers a quick, easy, and judgement-free way to pick up food in a timely manner. But one Kansas cop was served a little something extra with his standard Taco Bell beef tacos (and we’re not talking about supplemental Fire sauce packets). 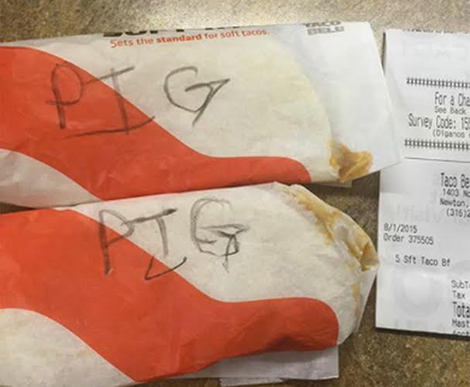 After ordering five tacos at a Newton location with his fiancé, the police officer found a nasty message reading ‘PIG’ on two of his soft tacos. His financé, furious over the incident, went straight back to the restaurant in that hopes that the restaurant would remake their food.